Burlington High School Principal's Blog: The BHS Band Presents the "Lunar Project"
The BHS Band Presents the "Lunar Project"
The BHS Marching Band would like to invite family, friends of the program, and members of the community to their 2nd Annual Preview Show. 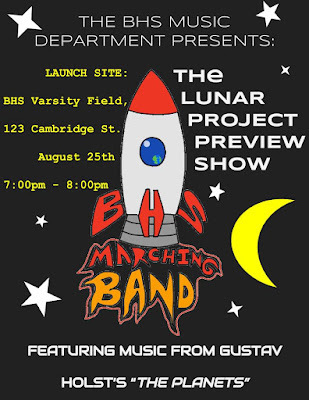 The students, staff, and volunteers of the band have been hard at work over the last two weeks of band camp to prepare their 2016 Fall Show "The Lunar Project," which tells the story of the Space Race between the US and Soviet Union and features the music of 'The Planets' Suite, Apollo 13, and Also Sprach Zarathustra. If you can't be there, the BHS Band will be live-streaming their performance on Periscope (@BurlingtonBand). If you go to their website (burlingtonband.weebly.com), you can follow the band on Twitter and receive an update from Periscope once they’re are ready to go.